Mold presence prompted the closure of Okee Schoolhouse, said a report. And so, to help others avoid the same incident, green cleaning company My Cleaning Products suggested two mold removal sprays made with organic ingredients. Mold treatment with them[Molderizer & Safe Shield]... is much less expensive as one doesn't have to pay anyone. Moreover, because both products are organic-based...an individual could also make sure that the treatment would not leave any harmful residue. Due to mold, Okee Schoolhouse in Lodi, Wisconsin was shut down. In response to it, green cleaning company My Cleaning Products suggested two organic mold removal sprays to help others avoid the same incident. News website hngnews.com reported about the mold presence in the old schoolhouse on November 20, 2013, MCP stated. It shared, based on it, that the recent complaints of people getting sick while in the building were what prompted the discovery of the fungus. And last week, it said that a testing confirmed its presence. According to the report, the mold found in the old schoolhouse was non-toxic, My Cleaning Products related. Nonetheless, it cited that it could still cause problems to health. And so protect the people from those risks, it relayed that town chairman Bob Collins announced that the building would be shut down. Here is a part of the post Mold Confirmed in Okee Schoolhouse by My Cleaning Products. “Wisconsin's Okee Schoolhouse in Lodi was shut down on Monday. The reason was mold presence. Mold could indeed bring in various risks to health, said My Cleaning Products. It cited that exposure to it could cause eyes, skin and throat irritations, allergies, coughing and sneezing. It stated that it could also worsen the condition of those with respiratory illnesses. Because of that, MCP advised the public to immediately kill mold soon after it's seen. However, given that hiring a mold removal contractor would cost big, it suggested the DIY remediation instead to everyone with a mold problem of less than ten square feet. Nonetheless, of the products to use in the process, MCP only recommended Molderizer and Safe Shield. 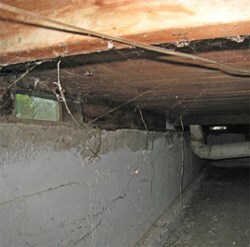 Mold treatment with them, it said, is much less expensive as one doesn't have to pay anyone. Moreover, because both products are organic-based, it stated that an individual could also make sure that the treatment would not leave any harmful residue. To prove those benefits true, the company additionally announced that it was giving out samples of the two products. Anyone who wants them, it shared, could get Molderizer and Safe Shield Complimentary Samples at MyCleaningProducts.com.